This section on Euphoria language gives the readers the basic understanding of it. 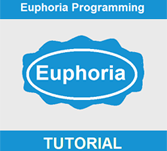 Euphoria is a simple, easy to learn, flexible and interpreted high-level programming language for Windows, DOS, FreeBSD, Linux and more. This chapter will describe each and everything a programmer needs to learn about Euphoria like its environment,syntax ,data types and operators, file handling, and controlling the flow of program. This chapter is specially designed for those aspiring students who are very intersted to learn and understand Euphoria in detail. Euphoria will be of great help for the IT professionals working as programmers. The zygnastic readers can access this chapter as a source of additional reading. Before moving on with this chapter, we need to have a basic knowledge of working on Linux or Windows. It is required to have some knowledge with any programming language like C, C++. We are required to have sound understanding of OS, memory allocation and de-allocation, and also the basics required for efficient programming and debugging.